Through master's hand our engravers in the ATELIER 1751 bring your dreams to life and create immortal works of art even persisting for generations. You probably cannot improve a bolt action rifle by J.P. SAUER & SOHN technically but every rifle can become a personality. According to this claim the Atelier 1751 by J.P. SAUER & SOHN knows almost no boundaries to fantasy and design when it comes to your individually manufactured rifle. 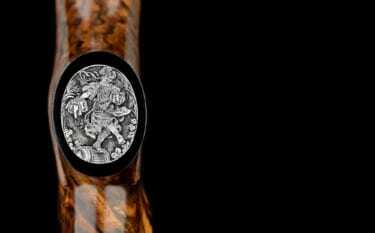 The realistic depiction of game in its natural surroundings is an artistic skill only master engravers are capable of in perfection. The Atelier 1751 exclusively works with the best in their field in order to create artworks like this leopard engraving. The background which is inlayed in gold and delicately shaded, the feline predator dozing on the tree as well as all further details and the graphic overall design are the true proof that a hand-engraved Sauer & Sohn is right at the top when it comes to the so-called league of “Best Guns”. Engraved firearms tell stories, whether they are fictitious or born from true experiences eternalised in steel, they will fascinate future generations and inspire them to pass them on. 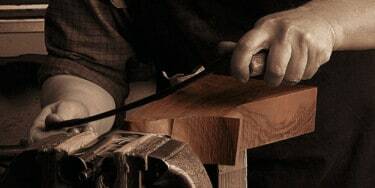 Whether it is a personally selected wooden stock, an individually designed bolt knob, a personalised barrel root ring or special engravings on the receiver, magazine base or pistol grip cap: In order to make your choice easier or challenge your creativity, you will find a selection of “standard suggestions” from the Atelier 1751 on the following pages. 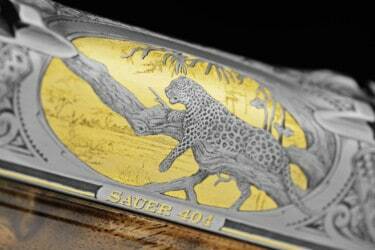 When we are talking about engraved firearms in the Atelier 1751 at J.P. SAUER & SOHN, we speak of hand engraving. For generations every S 404 or S 303 has been crafted a 100 % by renowned and experienced master engravers with great attention to detail. The standard range of the Atelier 1751 offers five different ornament engravings, making the choice of the animal engraving yours. Your passion perfectly eternalised: Whether it is English scroll with roe deer, vine or thistle leaves with wild boar or African game with acacia thorns. Compose your engraved firearm according to your personal preferences and wishes. We turn your passion into eternal works of art. An exclusive bolt knob or an inlay with initials framed by timeless English scroll or oak leaves are a sign of exclusive customisation. There is more to a hunting rifle than being just a mere tool, every single one of them is a personal companion for generations. Individualise your S 404 with a titanium nitrided bolt head or eternalise your name on the barrel root ring between receiver and barrel. This is how a S 404 will become your S 404. Nothing else makes your hunting firearm more unique than an elegant stock. Every single of these one-of-a- kind masterpieces fascinates the heart and the eye of each hunter through a formidable interplay of colour, pattern, light and shadow that has matured for centuries. In the Atelier 1751 of J.P. SAUER & SOHN you can make your dream come true.